This wedding photograph was taken on the dance floor in the main ballroom of Lombardi’s on the Bay; the spectacular Patchogue, NY waterfront catering venue located on The Great South Bay. Just outside this magnificent ballroom you are treated to expansive views of the bay and Fire Island, often during awesome sunsets. Looking elsewhere on this web site you will see examples of the kind of spectacular sunsets you and your guests will be treated to. There’s nothing quite like a magnificent sunset to create beautiful wedding pictures in front of. 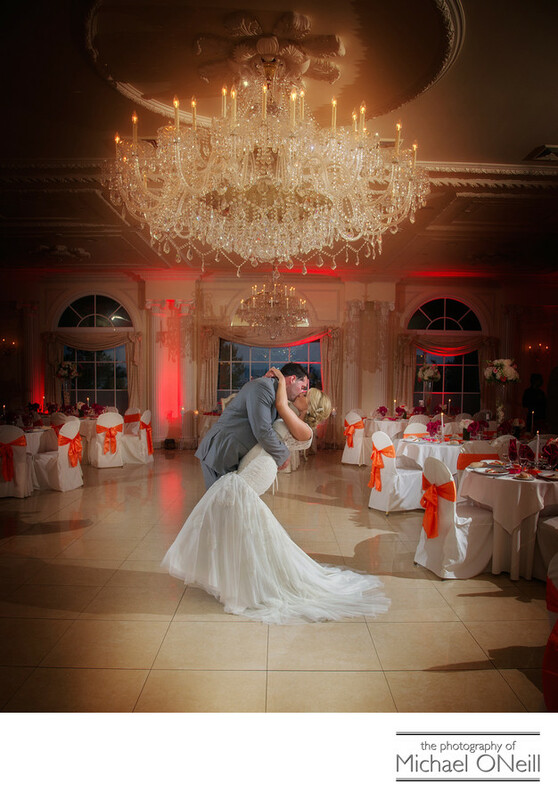 The Lombardi family owns three of the most special wedding reception venues on Long Island, New York. In addition to this one you can have your wedding needs catered to at Villa Lombardi’s in Holbrook, NY or Lombardi’s on the Sound, another magnificent waterfront venue located overlooking the Long Island Sound in Port Jefferson, NY. Additionally, the Lombardi’s group offers off premises catering and I have had the pleasure of working on catered events on private oceanfront estates in The Hamptons and Montauk, wineries and vineyards on the North Fork of Long Island and under awesome tents at private estate homes on Long Island. Like the Lombardi family I subscribe to the philosophy that "Reputation is Everything" and I consider it an honor and a privilege to have worked with them for more than twenty years. If you are planning a Lombardi’s wedding I hope you will call me at my East Northport, NY wedding studio and gallery to discuss your plans for your big day.